When I was first getting into cricket, way back in the hot summer of ’76, and first getting to know about the men who made up the England team, two places seemed secure. Tony Greig was captain and Alan Knott the wicket-keeper. AW Greig and APE Knott at six and seven were the engine-room of the team, and while batsmen and bowlers came and went, they were there for keeps, it seemed. But I remember my Dad telling me that there was another wicket-keeper, many thought even better than Knotty, who couldn’t get into the team – Knott being the far better batsman. I was intrigued. Better than Knotty, could it be true? When I discovered that he was another member of the multitudinous Taylor clan, it seemed time to investigate further. I don’t know how many Test cricketers the west midlands county of Staffordshire has produced – SF Barnes, David Steele and Kim Barnett are three that come to mind – but Robert William Taylor, known to the world as Bob, is in my view fit to stand with any of them. It was, as Christopher Martin-Jenkins once wrote, one of the happiest repercussions of the Packer revolution that this genial, dedicated craftsman, surely one of the nicest men to ever wear the three lions, finally got the Test career that his exceptional ability warranted. Starting out with his native county at the age of 16, he played three full seasons for Staffordshire, actually making his first-class debut in 1960 for the Minor Counties against the South Africans, before being snapped up by Derbyshire, whose long-serving George Dawkes was coming to the end of his career. Taylor made his debut for the county in June 1961; before long Dawkes had seen enough and, happy that the county had found a worthy successor, announced his retirement. Taylor later acknowledged his good fortune at arriving at the right time and also spared a thought for Gerry Wyatt, Dawkes’s longtime understudy, who had left the staff in 1960 after managing just a handful of games in a decade at the club. Although forever an unfashionable county, Derbyshire had a reasonably strong seam attack in the sixties and Taylor had plenty of opportunities with the likes of Les Jackson, Harold Rhodes, Ian Buxton and later Alan Ward to keep to. Although few of his victims were stumpings he was soon racking up the dismissals – 80 in 1962, 83 in 1963 and 86 – his best season’s haul – in 1965. Meanwhile word was going around the circuit that this young keeper was one to watch. His weakness was his batting – in eight seasons his best score was only 57 and in more than 300 innings from 1961-68 he passed 50 just three times – and this was a time when batsman-keeper Jim Parks was generally preferred to the superior gloveman, John Murray, for England. Not that this was anything new of course. Les Ames’ batting ability restricted George Duckworth’s England chances, while after the war the flamboyant Godfrey Evans, although nothing like as good a batsman as Ames, was still good enough to see off a host of rivals such as Surrey’s Arthur McIntyre and Northamptonshire’s Keith Andrew. And it was Andrew, who played just twice for England in 1954 and 1963, who was idolised by the young Taylor and whose career looked likely, for many years, to be repeated by his young fan. For while Knott was the showman, enormously popular with the crowds (and nobody can argue with five Test hundreds), Taylor was it seemed the craftsman, the keeper’s keeper, one who could perhaps have worked harder at his batting but who could stick around at number eight and provide valuable support when needed. After almost a decade of county cricket recognition came with selection for the tour of Australia and New Zealand in 1970. Taylor would have been under no illusions that he was there as Knott’s understudy, there in case his rival was ill or injured, but at that time he was happy to have a winter away, even if he managed just four first-class matches in Australia. As he put it later, “I couldn’t really complain, and it was some consolation when everyone kept telling me that I had helped to keep Alan Knott on his toes. Alan and I forged a strong mutual respect for each other on that tour … I was most touched by his gesture when the team was picked for the first Test – he came over to me and said, ‘bad luck Bob, keep going.’ ” There was to be an unexpected bonus for Taylor when the side reached New Zealand after their successful Ashes campaign – captain Ray Illingworth put him in the side for the first Test at Christchurch – although the player himself considered his selection as somewhat unsatisfactory. Knott had appeared in 28 consecutive Tests – after this blip he would go on to appear in another 61 in a row – and hardly deserved to miss out. On a tricky pitch Taylor kept as well as ever but was disappointed to be given out stumped when he believed his foot had never left the crease. It was on this tour, the first of three as England’s number two, that Taylor acquired his nickname, ‘Chat.’ There were numerous social functions for the team to attend and he was happy to talk to anyone who wanted to discuss cricket, even if, as he sometimes suspected, the other person didn’t know who he was talking to or what he was doing in the squad (“so tell me Bob, do you bat or bowl?”). He was thrilled with his first visit to Australia, particularly as it included meeting with Sir Donald Bradman and Bert Oldfield. There was an unexpected return to Australia the following winter – after the cancellation of the scheduled tour by South Africa, a Rest of the World side was assembled to go there instead, just as had happened in England in 1970. England had no tour that winter and Alan Knott was originally named in the World squad, but Taylor took his place when the Kent man dropped out. Farokh Engineer was the first choice, but Taylor played in the final unofficial Test at Adelaide, taking five catches. The next few years would prove frustrating ones for Taylor – firstly missing out on the trip to India and Pakistan in 1972-73 with an ear infection, along with the realisation that Knott had cemented his England place and never seemed likely to lose it. There were some consolations – in 1973 he had a benefit with Derbyshire, raising £7,000 – a tidy sum for the time – and in the same year he was picked for two one-day internationals against the West Indies, at Headingley and the Oval. In view of the limitations of his batting Taylor seems an odd choice now – Roger Tolchard had been to India, and even in 1973 David Bairstow would have been an adventurous choice – but he took his opportunity, and a fine stumping of Alvin Kallicharran off the bowling of Derek Underwood, helped, he believed, to get him on the trip to the Caribbean in early 1974. Despite batting well on that trip, and Knott being below his best form, he was unable to displace his rival. The same happened in Australia the following year; there was no chance of him being picked to face the rampaging Lillee and Thomson unless Knott sustained an injury. And this time there was no consolation cap in New Zealand either. Taylor succeeded Brian Bolus as captain of Derbyshire the following season and did the job for two years but he was no disciplinarian, however much he cared about the county’s fortunes, and he was glad to relinquish that responsibility to Eddie Barlow. He felt that it was affecting his keeping, though naturally nobody had noticed any decline in his performance. After being overlooked for the tour to India in 1976 he sadly told wife Cathy he wouldn’t be needing his touring equipment again. He would have loved to be at the Centenary Test which took place in Melbourne at the end of the trip. Unbeknown to him though, Taylor’s life was about to be transformed. Recognition came first in April, when he was named as one of Wisden’s Five Cricketers of the Year – the piece, by Michael Carey, began “wicket-keepers the world over will rejoice in the news that the Editor of Wisden has stepped in where England’s selectors have so often feared to tread and recognised the skill of Bob Taylor, whose artistry – there is no other word for it – behind the stumps has long illumined even the darkest hours of Derbyshire cricket.” It ended with a glum quote from the man himself – “there are about 300 county cricketers and we can’t all play for England.” But even as the almanack was hitting the shops plans were afoot for a scheme – World Series Cricket – which would take Alan Knott, by his own choice, out of the England reckoning. When the party was announced in September to tour Pakistan and New Zealand that winter RW Taylor was, to general delight, named as first-choice wicket-keeper – his understudy, young Paul Downton, had played just a handful of games for Kent and was unknown to most cricket watchers. While neither leg of the tour was especially successful for England, both series being drawn, Taylor relished his late opportunity and contributed with the bat, making 32 in his ‘comeback’ Test at Lahore and improving on that with a 45 at Christchurch. At that stage he believed he was keeping a seat warm for Knott on his inevitable return, but like everyone else had no idea when that might be. England were unbeaten in six home Tests in 1978 and Taylor was staggered to be named player of the series against New Zealand by Jim Laker – Ian Botham having taken 24 wickets in three Tests. In Australia that winter England prevailed 5-1 against a much-weakened Australian team led by Graham Yallop, Taylor’s most notable contribution being a 97 – his highest first-class score – at Adelaide. He was especially pleased to add 135 with county colleague Geoff Miller at an important time. He was retained in the squad for the World Cup in England the following year, but England were well beaten by the West Indies in the final and Taylor would make few appearances in the shorter format from then on. England had not lost a series since Taylor’s recall, but came down with a bump in Australia in 1979-80, going down 3-0 with both sides restored to full strength. In fact only Derek Underwood of England’s Packer players returned for that trip – Knott stayed in England. 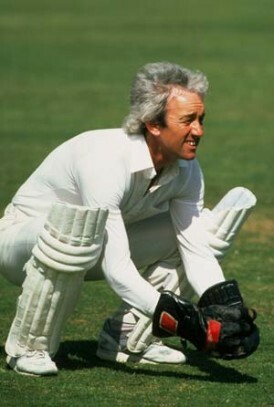 But Taylor’s unforgettable part in the Jubilee Test at Bombay in March 1980 – he took ten catches, mostly off Botham, and made 45 in a stand of 114 – with Botham again of course, it was the Somerset all-rounder’s greatest all-round performance – was not enough to keep him in the England team that summer. Knott returned to face the West Indies, and when he failed, Bairstow was tried instead. Taylor was disappointed and believed his Test career was over after 26 caps. He would be 40 in 1981, after all. Although left out of the party for the West Indies – as he expected to be – Taylor occupied his time that winter with his testimonial which Derbyshire had given him for the following season; but that season would prove to be a memorable and rewarding one. He was awarded the MBE, made a maiden hundred against Yorkshire at Sheffield, set a new world record for the number of catches taken in a career, netted £54,000 from his testimonial, and to cap it all was recalled to the England side and played in two of the greatest finishes in Ashes history, at Headingley and Old Trafford. Although he lost his place to Knott for the final two Tests these would prove to be the Kent keeper’s last England appearances and Taylor was confirmed as the first choice again for the tour of India under Keith Fletcher. He also went on the next two winter tours, on the last occasion, to New Zealand and Pakistan, without a recognised back-up (Graeme Fowler kept wicket in a one-day match), testament to his legendary fitness at the age of 42. In 1984 the West Indians were back in town and once again Taylor made way, this time for Paul Downton. He knew that this time it was for good, and retired at the end of that season, now holder of the record for dismissals in first-class cricket – one that seems likely to be held by him indefinitely. There was, though, one pleasing postscript – at Lord’s in 1986 England’s Bruce French was injured and unable to take his place behind the stumps; Bill Athey was tried briefly but then someone remembered that Bob Taylor was at the ground with Cornhill Insurance, and he was persuaded, with the agreement of New Zealand’s captain, to fill in for the rest of the day. The only sadness is that he was unable to make a dismissal – how good the line ‘c sub (RW Taylor)’ would have looked on the scorecard. It is unlikely, as he acknowledges, that someone with his limited batting skills would be able to play 57 Tests today – witness the fortunes of Chris Read and James Foster, both far better batsmen than Taylor but not quite as good, it would appear, as Matt Prior. Thankfully in 1977 the selectors went for the best keeper available to them, and a rewarding and satisfying career was the result. “Taylor’s most notable contribution being a 97 – his highest first-class score – at Adelaide” – I think you mean, at that time, because, as you add, he hit a century against Yorkshire in 1981. Splitting hairs a bit here: Knott had played in the previous 20 Tests when Taylor played in NZ, and then played in the next 65. There’s a dozen or so more Test cricketers born in Staffordshire, including Walter Robins, Eric Hollies, Ken Higgs and Dominic Cork.